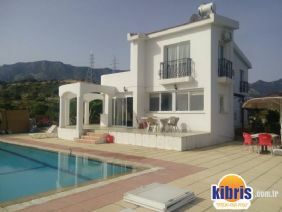 If you are looking for the villa that would give you a relaxing atmosphere in the shade of pines and gardens but at the same time would be located not far from the Kyrenia centre, Villa Sabrina is definitely an option to look at. The house will accommodate up to 8 guests with comfort. 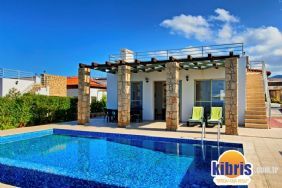 Light spacious and comfortable bedrooms upstairs and big open space lounge area with fireplace can become the very best place of your stay in North Cyprus. All the bedrooms feature fantastic unobstructed views to both sea and mountains which you can enjoy in the silence of the peaceful surroundings from the balconies or simply looking out the windows. If you prefer to relax in the tranquil turquoise waters of the freeform swimming pool it will welcome you and help to enjoy the freshness of the air with fantastic pine aroma. Having a big outside area Villa Sabrina can be a welcoming home for the big family offering a comfort entertainment to all the guests. Another great feature of this house is its location. Just imagine – only few minute walk and you can dine in a very nice restaurant and a short 5 minute drive can bring you either to the nearest beach or to the city centre. All you need for a great holiday is only your swimming suit, camera and being prepared for new experience!